Is there a future for print advertising? This question keeps popping up and we feel the need to address it. Advertisers have been, and are continuing to, transition their traditional practices to the digital world. They are using similar concepts and designs when it comes to the appearance of their ads; however, their avenues have significantly changed. Mobile advertising, banner ads, and social media advertising are the main avenues marketers are using, but how can you tell which is more effective than the other? There are various forms of print advertising: those in magazines, newspapers, on billboards and posters, and direct mail. 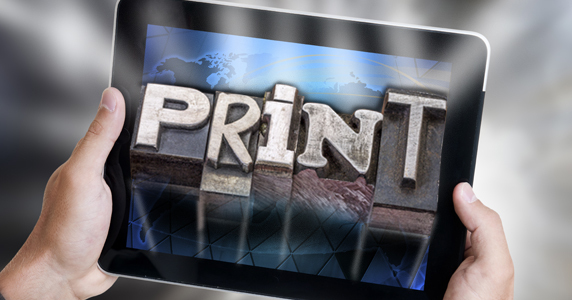 It is said that print ads have a more lasting effect than digital ads. A huge billboard in New York City has a lifetime of about a month, or however long you pay for it. The amount of eyes that see it on a daily basis is enormous and that type of content doesn’t move as quickly as the little ad on your Facebook newsfeed does. The content that people view online can be more perishable due to such high volumes being pushed out in order to compete with one another. This sort of short-lived content doesn’t possess the quality that readers and customers desire. Although the world has gone digital, major print publications can still find success by focusing their circulation on a smaller audience consisting of key industry influencers and loyal subscribers. The loyalty and passion of those readers are key and the ads hitting those readers have more impact and are longer lasting. There’s also something about print that makes it more eternal. With Facebook Business Manager and other similar services, you can quickly create and upload ads, pick your target market, and send them out into the digital world, but how effective is this? Digital ads may capture a customer’s attention in the moment with their bold text and quality imagery; however, they are quickly forgotten. It is very easy to scroll past paid ads on your social media newsfeed; they get lost in all the clutter. And with ad blocker software, you can bypass banner ads altogether. The desirability and willingness to purchase the product or service as a result of seeing a digital ad is less likely than it is with a physical print ad. Print ads are said to be more stimulating—encouraging an emotional reaction from the customer. The information on the ad and the source of the content is better absorbed and retained longer with print. So, although digital ads have a quick turnaround, print ads are more memorable. At the end of the day, we don’t believe that there will ever be a replacement for print advertising. It is the oldest form of communication out there, so to replace something like that would be a difficult, maybe impossible, task to accomplish.